Get your Cuppa and the Choccy Biscuits….it’s going to be a long one! Well good afternoon! I know I say this often but I cannot believe where the time has gone since I last posted. I have been busy mind! And I have absolutely loads to share with you so let’s crack on shall we? First of all the new Catalogue… Isn’t it beautiful? and chock full of amazing products and brilliant inspiration! Want a copy? Well you can get yours by clicking the link on the right and a copy will load up for you or better still go to the PayPal link and and purchase your very own copy for just £ 4.95, you can get one by joining one of my Stamp Clubs (I have a space in my Stampers Ten group, contact me now for more details!) or you can get one by having your own event – contact me now for more details! But it doesn’t stop there with all the amazing stuff! Oh! No! We have more! The hostess benefits have changed too! And it is sooooo much better with the most brilliant stamp sets available for you! 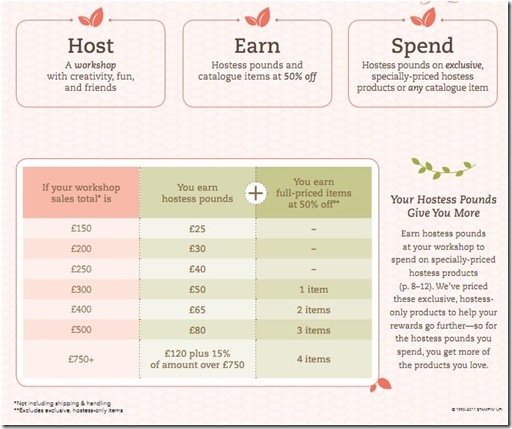 There are so many New lovely things to Order and the HOSTESS BENEFITS changed from 1st October so you can start to benefit right away! You can CHOOSE HOW TO SPEND YOUR HOSTESS POUNDS. I have a one or two places left in my Stampers Club so you can Spread The Cost and still get all the FREE Hostess Pounds to Spend……Email me if you want to JOIN either my Stampers Ten or my Stampers Six Stamp Clubs – there’s always room for more Stampers! Ever thought of JOINING Stampin’ UP???? If you join in October STAMPIN UP will give you ALL FIVE NEW IN COLOUR INKPADS AND A PACK OF ASSORTMENT IN COLOUR CARDSTOCK….Just for Joining! amazing YES?! My Special Offer for This Month is FREE Shipping on ALL Orders over £45. ONLY AVAILABLE for a short while. So this fantastic box and card set was created by the Lovely Kirsteen for the Tartan Stampers Mini convention and you can view more from Kirsteen by clicking her name. I loved this so much I did tell Kirsteen I would probably end up stalking her! Oh! Dear! This is made with the NEW Candy Wrapper die from Sizzix (yes you can get it right in your Ideas Book and Catalogue!) and is teamed with the creepily delightful Frightful Sight DSP. This is going to end up as a class piece I fear as I just love it to pieces, I never thought much to the Owl Builder Punch set until I saw it in this and Yes that is the Build a blossom petal used to create that lil’ ol Devil! This is another ‘make’ from the Tartan Stampers – this time Jen from Stampin Glitz who made this superb Clean and Simple card using the delightful Delicate Doilies stamp set and the very versatile Lace Ribbon Border – Yes! both new! Here Jen has teamed them with Basic Black CS, ink and ribbon and Melon Mambo CS. This is the Timeless Portrait product suite (new phrase? more on that later) This lovely card was made by Dawn Silver who heads up the Tartan Stampers. She has used the Brand New Timeless Portrait DSP, First Edition DSP, Basic Black CS and Satin Ribbon, then Dawn has embossed the Forever Young Stamp in black (yes we do Black embossing powder – Who Knew?!) And it is finished with the Lace Ribbon Border punch – did I mention how versatile that is? Ok, a few more cards later! Why has it taken me so long to post? Well, funny you should ask! Firstly I attended the Tartan Stampers Mini convention here in Glasgow. Around twenty seven of us got together for a whole weekend of crafting fun! The weekend started with a meal out then on the Saturday we did a shoebox swap (I will show you mine in a later post) where we all design a project and then pop enough product in a box for the other 26 girls to make one each! So much fun and a great way to quickly learn new techniques or try new and different products! Another meal out on the Saturday night then on Sunday we got down and dirty with some scrap book pages and a fabulous mini album complete with pin wheels and pop ups! And I never noticed the weather until My Beloved came and collected me, tired and crafted out! Following that much fun it was back to work and time to get my eldest son back to University. What a nightmare that has turned out to be! This is his second year so he comes out of halls of residence and into private accommodation. On the thursday before his return one of the boys who had already moved in sent pictures of my sons room…complete with Gas water boiler and electric fuse box resplendent with wirework! Alarm bells started to go off….they haven’t stopped yet! When we finally got there on the Saturday the whole place was disgustingly dirty. My son’s room was worse than I had possibly imagined and came complete with four damp walls (I must mention that the temperature in Durham was 26 degrees and the walls were running with water! So I dare NOT imagine what it would be like in the dead of winter like the ones we have had recently!) mouse dropping, mouse dinner crumbs, mouse wee, a mattress that was crawling and a fire window that was jammed shut! Then I got a longer look at the rest of the flat. The kitchen took me more than three hours to clean and disinfect the cupboards, work surfaces and disinfect the pots and cutlery so that I could feel comfortable having a cup of tea! The bathrooms enjoyed a very liberal sprinkle of Domestos before I even thought about starting in them. I cannot express how awful this place is. I would like to say that we are NOT paying an awful in rent but we are! a huge amount! I would like to say that the Landlords are mortified that the property is in this awful state…but they are not. the claim that is has been professionally cleaned…mind you they did not say that it was cleaned in the last fifteen years! As any parent would, we have insisted that he not stay there and have sought help from the University to help get alternative temporary accommodation for our son until we can sort something more permanent. What I find the most awful is peoples attitudes toward student accommodation. They seem to think that standards don’t apply because it is students that will be living in these flats. I realise that students are a pain in the back side and often have no care for the properties they are staying in. But that is not all students just a few and it is usually the parents who are paying for the accommodation that our children are staying in. It is heartbreaking to consider leaving your child in such dismal and appalling conditions voluntarily! If we were finding people living in these conditions who were socially challenged and poor there would be total outrage! why then are students expected to put up with these conditions JUST BECAUSE THEY ARE STUDENTS? soap box done with…for now! On a lighter note…This coming Saturday is our October Technique Tornado day! Have you booked your place? if not head on up to the link on the right and get booked in – we have loads of fun lined up and a guest designer too! It is first come first served so don’t delay book today! And then on 12th November we have our Christmas Stamp a Stack Day – we will make five designs of card four times = twenty cards in total and a special make in the middle of the day! Book your place now as there are very few places left – it is proving to be a really popular event! Finally a couple of cards featuring another new product….Pennant Parade! I made these very simple little cards using the now retired Jolly Holiday DSP and the very New Pennant Parade Stamp set and Punch. I stamped the Pennant shape three times using Old Olive on Whisper White CS and punched it out before adhering the Pennants together. I stamped the tree pot and Star the added the ‘tree’ to the space in between (of course I measured it – doesn’t it look pretty perfect!!!!) I then layered this onto the DSP, Cherry Cobbler and Old Olive Card stock and Voila! and super little Christmas card you can get the kids to help make! A Retirement Update….Excitement….and The Next Big Thing!